Getting rid of eye floaters is not at all a hard task to perform. Many of us will encounter the development of eye floaters in our eyes at some points in life. They are all simply a part of the aging process and there is no way we can deny this natural process after all. Although there are no real solution available today that can help one to get rid of eye floaters directly without undergoing risky operations, there are however some guides that have been advised by many that could at least reduce the symptoms of eye floaters. Eye floaters are some dark specks or wiggly lines in eyes, and they are there floating around inside our eyes. Some may have those floaters in one eye, while others may have them in both. We see them as they cross our line of vision but when we try to look and focus at them, they always tend to swirl away. Since they are inside our eyeballs, they will follow every movement of the eyes making it hard to focus on them. This behavior has caused annoyance as well as frustrations for many making people wanting to eliminate those eye floaters right away. These annoying flying dark specks are most noticeable against a plain and bright background such as a large painted white wall or the clear blue sky. There are three main causes for the development of eye floaters. First, they can be a result of the left over debris created during the development of the eyes before we are born, and these trapped debris are now released into our eyes and float around as the vitreous humor, the transparent gel like substance that holds them in place now starts to liquefy. Vitreous humor fills the entire eyeball and maintain the eye’s structure. It is in gel form the moment we are born and by the time we reach the age of 30, twenty percent of this gel has become liquefied , and by the time we reach the age of 70, it is estimated that three quarter of this gel would have been liquefied by then. This is a natural phenomenon and is simply a part of the aging process of our eyes. The second cause of eye floaters could be due this vitreous humor itself being liquefied as we age. As the gel is made up of roughly 99 percent water and one percent of solid cellulose substance that acts as a fiber-like net that holds all the water together, the liquefied gel causes the solid cellulose substance to break down and clump together thereby allowing them to start floating around in the liquefied vitreous humor in our eyes. These floaters are often seen as being in the form of strings. The third cause of eye floaters is the tear of the retinal wall (better known as retinal detachment). When retinal detachment happens, those torn cells, tissues or even tiny blood droplets may get into our eyeballs and thus floating in our eyes and be seen as floaters. These types of eye floaters are often seen in the shape of round dark colored circle. Although there are many procedures around that can cure eye floaters such as vitrectomy and laser treatment, however, they are not without risks. As in most cases, these eye floaters are totally harmless and really requires no treatment. Doctors generally do not recommend any of these procedures at all. Victrectomy is a procedure that involves the drainage of all the vitreous fluid and then replace it with a special salt solution. This operation requires the poking of tiny needles into the eyes to drain the fluid and is therefore often comes with some risk. Laser treatment for eye floaters on the other hand, uses a more recent technological advanced method to cure eye floaters. Doctors will use a laser beam known as YAG laser to aim at the floaters and then blast and vaporize them away. The entire procedure typically last only about 10 to 15 minutes. Although effective, patients have been found to develop cataract later on in life and hence, doctors usually do not advice younger patients to undergo this procedure. Who Are At Risks of Developing Eye Floaters? The very first moment you encounter floaters in your eyes, it is best to consult your doctor or an eye specialist immediately. Make an appointment and get your eyes examined. Although most of the eye floaters are generally harmless, consulting an eye specialist is important as to rule out any chances of retinal detachment which if left unattended may lead to blindness. Be prepared to be given eye drops that dilate your pupil which allows the eye specialist to look inside your eyes through some special instruments. Even after the examination, your pupil will stay dilated and may last up to several hours more before the effects wear off. As such, you will feel uncomfortable seeing in broad daylight, let alone driving. So, it would be wise to bring along your sunglasses when going for the doctor’s appointment. If you have been experiencing a sudden onset of many eye floaters that are accompanied by flashes of lights in your peripheral vision, that could be a sign of retinal detachment. Because the retina does not exhibit the sense of pain. In fact flashes of light is the warning sign. As has been mentioned, consulting your eye specialist immediately is important as a detached retinal could lead to blindness. If you are only noticing eye floaters under bright daylights, then you eye floaters condition is mild. On the other hand, if you are noticing eye floaters even under dim lighting or your vision are severely disrupted by many eye floaters, then you have a more severe case. As eye floaters are really annoying and affect many parts of your daily life, for instance reading a book, working on the computer screen and even driving on the road. It truly degrades your quality of life. However, there is something that you can try to get rid of eye floaters by yourself by following these advice which many people have claimed to be effective. Although these will not directly cure your eye floaters, they help reduce the symptoms or at least increase your quality of life. For more information about these eye floaters and available treatments read how Vitreolent eye drops can be a potential eye floaters solution. 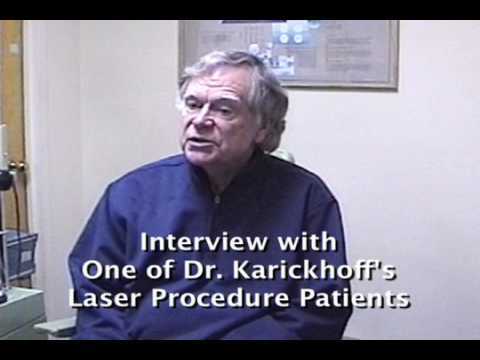 Laser Eye Floater Treatment by John Karickhoff, M.D. I remember an eye specialist that i have consulted in europe years ago has indicated a possible cure for eye floaters for many sufferers. You have your entire LIFE ahead of you it is very important to have 100% of your eyes if that your desire. first stop listenting and believing all the negative talk about theres know cure. Pray and trust God ask him to get rid of your floaters in your eyes and he will. By asking God to heal you and just believe he will what do you have to lose but the floaters in your percious beatiful eyes…..Thats our answer Good Luck…. Joan God wanted you to have eye floaters or He wouldn’t have given them to you. You are going against God by asking Him to take away what he gave you. Jennifer, I remember I’ve been put on Cipro antibiotics the days before the onset of eye floaters. Is that the cause or reason? Floaters caused by antibiotics? To rid of eye floaters, I hv tried succesfully. Look at the grass or a tree of green leaves in the morning at 645 am to 7 am when the sun rise. Wish you the best. I heard about this Eye That you are talking about but I haven’t tried it, Does it give permanent results? I have been dealing with dark circles and floaters all my life. I hope this will help because I am going to order it tomorrow. Eye Rid works well for Eye Floaters and dark circles. I used it after my friend told me about it and the eye floaters were gone after 3 use. Its an eye mask that I wear like every other day in the afternoon for 30 minutes, bought it from eyerid.com. I like it, Hope this was helpful, good luck everyone. Eye Rid is for dark circles under the eye, not for floaters! Nany is obviously just trying to drum up business for eyerid.com, don’t believe this is good for floaters! you said 3.0 id it possible to be at risk if its 2.25 ? Prescription drugs, especially antibiotics (of all types) can cause eye floaters. If people are not aware of this they may continue to pollute their bodies with this poison and wonder why it won’t go away, instead of what they should be doing, removing it. Stay away from all drugs. It can take years to remove all remnants of these drugs from your cells and this is why floaters can stick around for so long. I believe they are remnants of the antibiotics. One of the quickest ways to detox your body of these pests is to do a regular water fast and then follow it with raw food diet. It may still take some time to detox completely, but regular fasting can help speed up the process of elimination. If you are fit and healthy (and determined) enough, it is said that a 20 day fast can cure your body of any ailment. Doctors will not tell you this though, they are beholden to drug companies, so don’t expect them to be supportive, do your own research. These kinds of effects from antibiotics can have a delayed effect and take months to develop, even after you have stopped taking the poison. I developed both tinnitus and eye floaters, tingling, numbness and a myriad of symptoms, all have been linked to antibiotics and I have finally pinpointed where this all came from. I hope this helps someone out there, stay away from drugs and go back to nature, it’s the only way to cure your body, remove this poison, but it may take some time for complete elimination, so patience is required. What a incompetence you wrote? You dont have basic knowledge what cause floaters.”I believe they are remnants of the antibiotics.” and I belive that wall have better knowledge about floaters. Antibiotics cant cause floaters because if they can pass to vitreous then we can easly create cure(the problem with cure is that we cant pass to vitreous). So any of Prescription drugs cant cause floaters. ” If you are fit and healthy (and determined) enough, it is said that a 20 day fast can cure your body of any ailment. Doctors will not tell you this though, they are beholden to drug companies, so don’t expect them to be supportive, do your own research.” funny because you spread quackery from site which sells “cure” for floaters, so they dont have conflict of interest?. “I hope this helps someone out there, stay away from drugs and go back to nature, it’s the only way to cure your body, remove this poison, but it may take some time for complete elimination, so patience is required.” typical incompetence from person with low knowledge. Poison? you think that “nature” dont create poison? the dose make poison. “I developed both tinnitus and eye floaters, tingling, numbness and a myriad of symptoms, all have been linked to antibiotics and I have finally pinpointed where this all came from. I” or maybe they are from diesease for which you take antibiotics?. Like name says they are antibiotics and they have nothing to do with floaters. “Dariusz” what is your counter to her statements? I a lot of counter commentary attacking her claims but you never give data or facts to support your perspective. what evidence do you give to support what you say and debunks her claims?